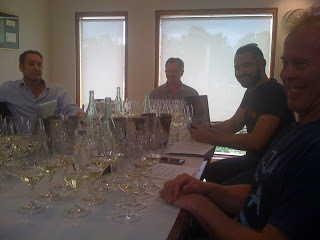 The purpose of the event was to introduce visiting American wine social media guru Rick Bakas to the glories of Hunter wine and I was lucky enough to score an invite to said masterclass, which I dutifully attended, just to keep an eye on proceedings and such…. Kicking off the event was a typically enjoyable bracket of the Hunter’s ‘gift to the world’ Semillon, with Andrew ‘Thommo’ Thomas the man on hosting duties for this bracket. As usual ‘Thommo’ waxed lyrical on the joys of Hunter Sem (they say that Thommo can talk underwater) but without embellishment- he’s a straight shooter is Thommo, which makes him more believable. Add that to almost 25 years in the Hunter as a winemaker and you’ve got a man who knows the place inside out, and makes some of the regions finest wines to boot. All of which adds up to plenty of engaging conversations about style, typicity and winemaking techniques, fuelled by a particularly experienced cadre of winemakers also in the room to add their own opinions. Sadly I wasn’t able to keep up with all that was said during this bracket, particularly given I was busy trying to tweet, taste and chat all at once. I did manage a few odd points though, detailed below. Oh and the other winemakers in the room included Iain ‘Riggsy’ Riggs (Brokenwood), Jim ‘Chatto’ Chatto (Pepper Tree) and Andrew ‘Spinners’ Spinaze (Tyrrells). I’m going to keep using their nicknames in this post for simplicity. – The Hunter produces just 5,000 tonnes per year of Semillon (out of 15,000ish total for the Hunter) 80-90% of the Semillon is hand picked which is quite unique in the context of the Australian wine industry (where machine harvesting is still the norm). – Thommo, like a few winemakers, crushes his fruit but does not destem. This makes it easier for the must to move the must through the press. This is done apparently as ‘Semillon has slippery skins’ and is know to clog the press. – ‘Spinners’ related one of Bruce Tyrrell’s comments to the crowd, namely that screwcaps are ‘the saviour of Hunter Semillon’. On that topic, Thommo has had to reject large volumes of his older Sems (those held back for mature release) due to cork related problems associated with random oxidation and variable development. He also finds that cork gives a flat spot to his Semillons at 2-3 years of age that is not apparent on the screwcapped version. – Riggsy retold a story of the first time wine critic Robert Parker was served a Hunter Valley Semillon. Parker simply wrote in his tasting note that ‘he had no idea what he was tasting and had tasted nothing like it before.’ He gave it no rating as a result, though everyone in the room wished he had given it a 97 ‘so we could all buy a Ferrari’ (Riggsy). – Riggsy believes that the secret to the a good Hunter vintage is cloud cover, that although the Hunter is a warm region, the extra humidity and cloud cover tends to soften the harshness of the sun. – Spinners believes that ‘wax and soap’ are the aroma/flavour indicators of a very good Hunter Semillon vintage. 2005 is one recent vintage that many agreed shows this. RRP is in the brackets next to the wine name. Our host for this bracket was Andrew ‘Spinners’ Spinaze, another well versed Hunter veteran (and again a renowned craftsmen of fine Hunter wines. Spinners believes that, in the rush to acknowledge how unique the Semillon is, that that the limelight has been taken off Hunter Chardonnay, undeservedly in fact. One thing of particular interest that Spinners explained was how the first Tyrrells Chardonnays – one of the first in Australia in fact – were initially produced. The process in fact is probably closer to Semillon than Chardonnay, with the fruit picked early and quite green, with a short maturation in large (4,500 litre) oak barrels where they spent just 3 months before release. Spinners also believes that to make good Hunter Chardonnay you need to retain acidity and freshness. This is accomplished by preventing the wines going through malolactic fermentation and then giving them only restricted time in oak (usually less than 12 months). Given how strong the most recent Tyrrells Chardonnays are it’s hard to disagree with this style. But it’s not the be all and end all of Hunter Chardonnay, as the tasting proved. 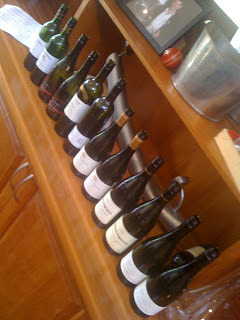 As before, all served with the bottle in front of us and at a brisk – but not fast – pace. 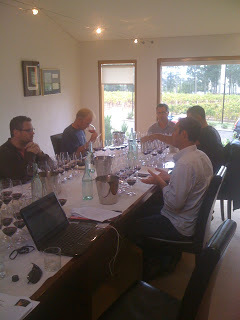 This bracket was hosted by Pepper Tree winemaker Jim Chatto. The idea with this bracket was to explore two good vintages – 2007 and 2009 – and how that transaled into the wines of five different producers. 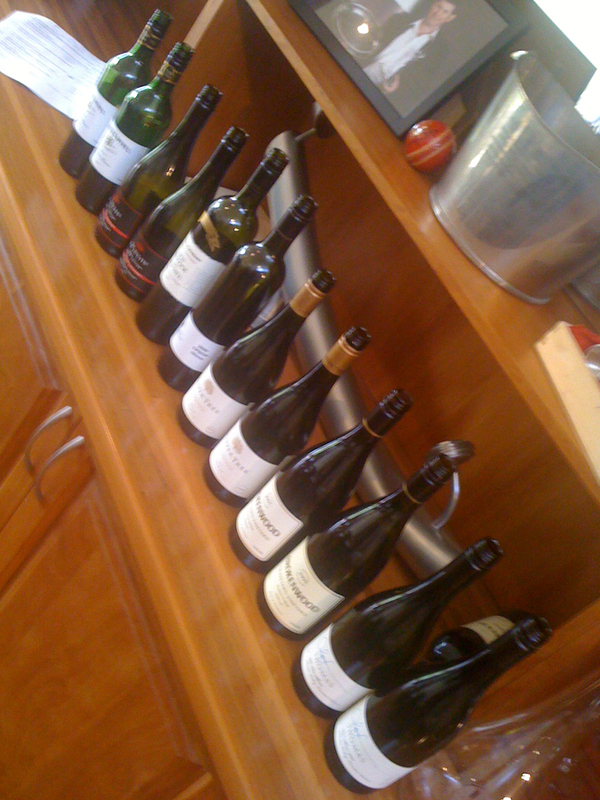 We thus had ten glasses in front of us, with 2 vintages of each wine. These were served single blind but I ended up far too slow and retasted again with the labels in front of me. As for vintages these are quite different years. 2007 was hot, dry and warm producing quite firm, full flavoured wines from very low yields (up to 30% down according to Chatto). Viognier like purple fragrance to this. Violets. Really quite floral even. Juicy, lots of deep, licoricey in a quite light style. Really twister, white pepper meets boysenberry style. Very pretty. Quite light tannins. Loved this more last time, I think this looks a little washed out in this context? 17/90 (looked very skinny and odd here. Shutting down?). (Once again a big thankyou to the HVWIA for making this trip happen and also to the producers themselves for breaking up their weekend to deal with us hooligans. Thanks for that Andrew. As a Hunter fan, some interesting and helpful results. I've heard that '07 Graveyard described as, well, "animale" is one way of putting it. Seems like you either get a good bottle and it's miraculous, or a brett-monster. The bottle I had was sublime (95/96 points or so, if I recall). Not thinnish at all. Big. Multi-layered. Complex. Wow. I have two cellared, so hopefully they won't be duds. I hope you get to try a good bottle one day!! I do have to buy some De Iuliis Limited Release!! Will look out for the Braemore '06 too. Love that Scarborough White Label '07 too. "Leg opener"!! Definitely get on the De Iuliis train. Really smart wines.